One of the things I love about eating out and exploring new food spots is finding memorable meals in some of the most unexpected places. Several weeks ago I had the privilege of being invited to dine at one of Fairfield County’s up-and-coming restaurants: Bistro 7 in Wilton. Known for their seasonal menu created from locally sourced ingredients including gluten-free and vegetarian options, a beer and wine menu that is “worth the sip” as the Bistro 7 website explains, and their support of the Slow Food Movement, ConnFact, and GMOFreeCT, Bistro 7 is a place you really must try. 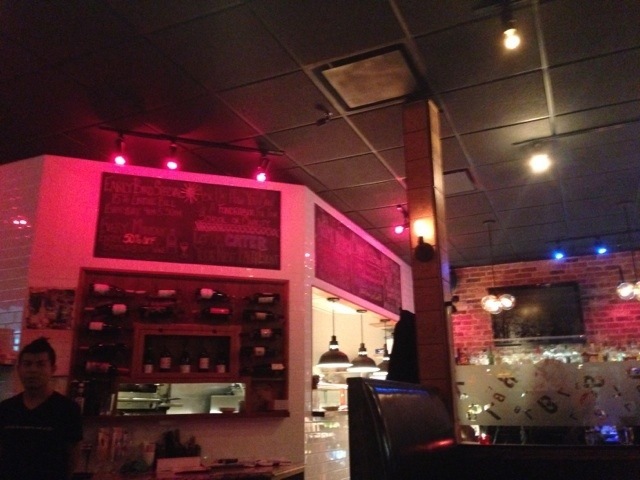 And while it is located in one of those unexpected places, sharing a building with a hardware store and a pizza joint, for me that’s part of what makes this meal memorable – a unique location paired with excellent food. Yes, excellent food. 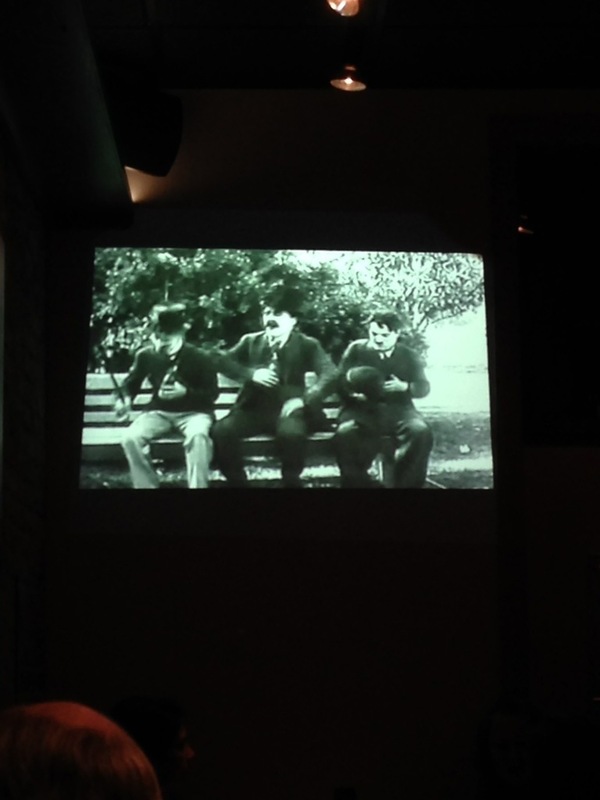 The inside of Bistro 7 is cozy and comfortable, yet it has an edgy vibe with brick exposed walls, low lighting, and black and white movies playing on the wall (we watched Charlie Chaplin for part of the evening). The waitstaff is extremely friendly and knowledgeable of the menu and wine list, which always makes one’s dining experience enjoyable and memorable. When Chef Tony chatted with us for a few minutes about the menu something that stuck with me is when he said, “If I can’t eat it, I don’t serve it.” To me, this philosophy truly shows how dedicated, passionate, and invested Chef Tony is in serving food that he is not only proud of, but also food that he’s eating. 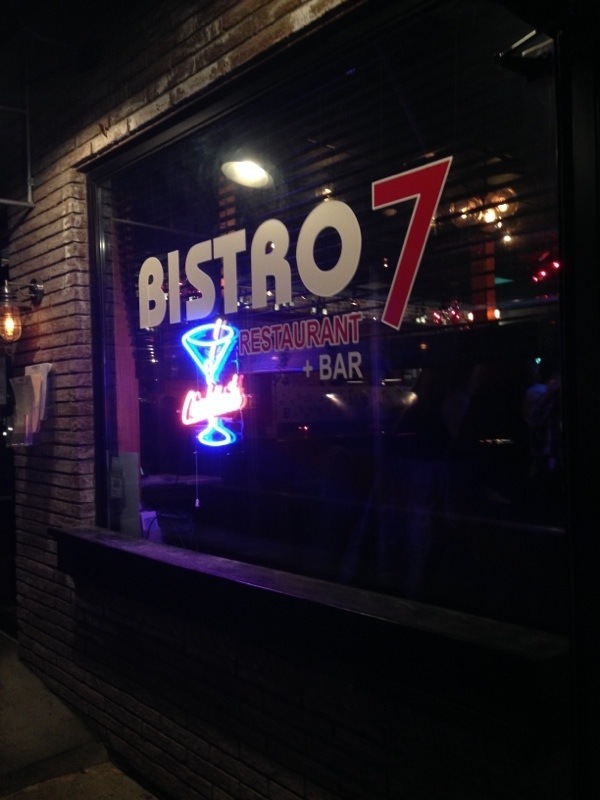 So let me me show you what food we enjoyed at Bistro 7. There is a story behind these risotto balls, or arancini balls as they’re also known, and you know I always love a good story about food. The owner Breno Donatti shared with us that during a recent trip to Italy he was able to experience an arancini bar, and when he returned from his trip he asked Chef Tony to create an arancini ball for the menu. 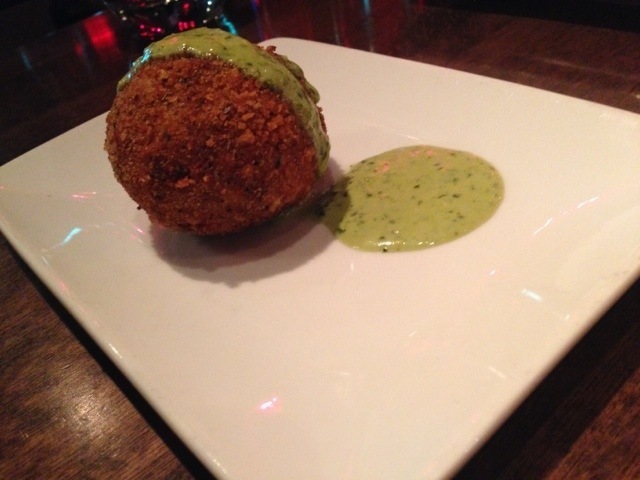 Served on a simple, clean white plate with some basil pesto cream sauce drizzled over the top, the Beef and Gouda Risotto balls at Bistro 7 are some of the best risotto balls I’ve ever had. 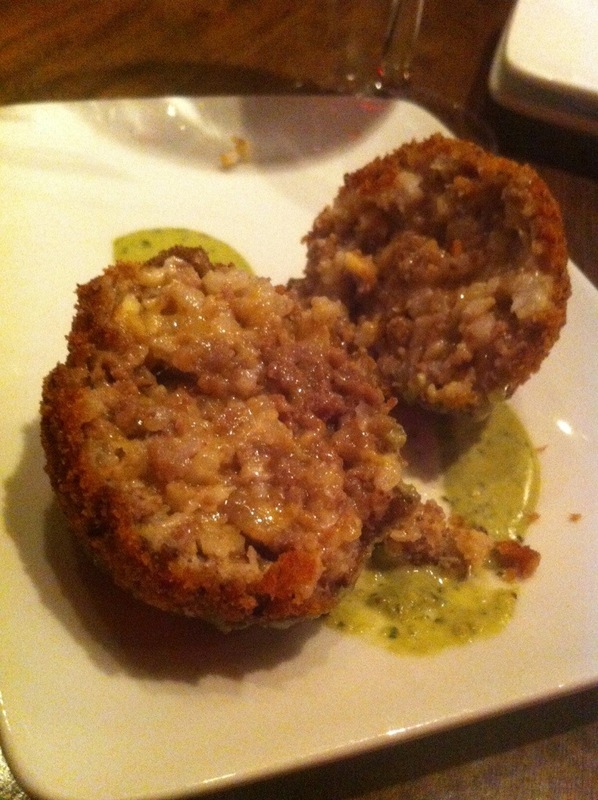 Made with Saugatuck Craft Butchery beef, smoked gouda cheese, rice, egg, seasoned breadcrumbs and a little cayenne pepper, these risotto balls are a beautiful golden color with just the right consistency and texture you want when ordering arancini – a perfect balance of rice, egg, breadcrumbs, and all the other ingredients combined. The basil pesto cream sauce is light, despite being made with cream, and you can taste how very fresh all the ingredients are. Also, despite being five inches in diameter, the risotto ball was filling but not so much that I couldn’t eat the rest of my meal and to me that’s a win-win. 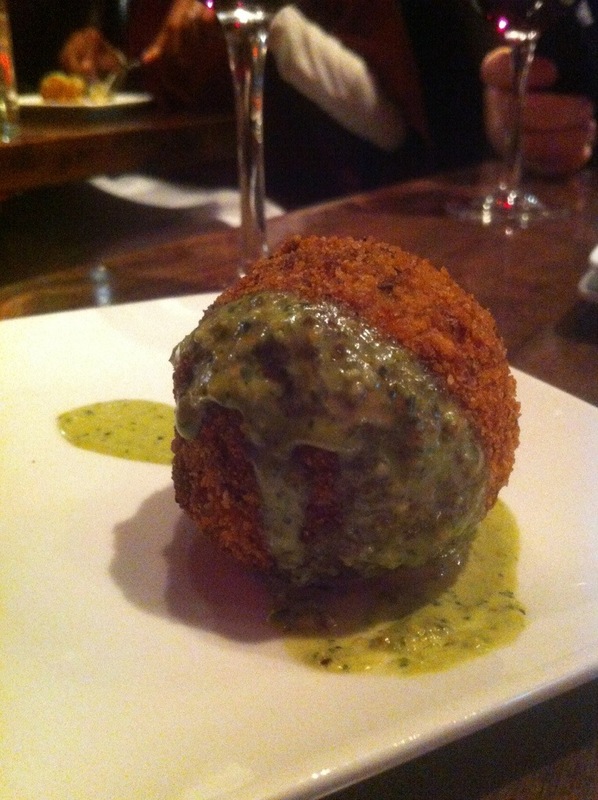 The beef and gouda risotto balls were paired very nicely with a Pinot Noir, 120 Santa Rita from Chile (2012). 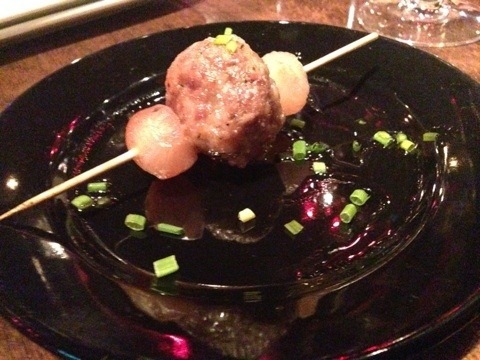 Paired with Syrah, Monte de Luz from Uruguay (2008), the pork meatball was hugged by two pickled pearl onions on a skewer. And I say hugged because when you eat this meatball you want some of the onion with each bite; the flavor of the onions is sweet and I think serves to accentuate and balance the slight vinegar flavor the meatballs have. 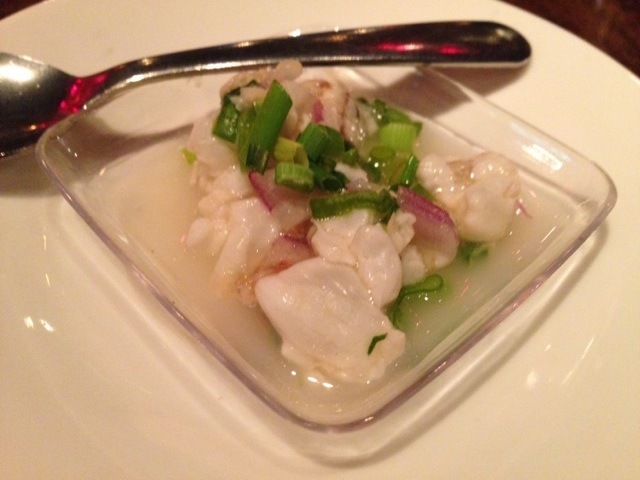 When I took a bite of the Scallop and Shrimp Ceviche at Bistro 7 I immediately wanted to be in a warm climate, possibly poolside. The freshest ingredients are used in this dish and the unmistakeable flavors of the red onion, lime juice, and cilantro create a wonderful trio of flavors which compliments the shrimp and scallops. This course was paired with a Sauvignon Blanc, 900 Grapes from New Zealand (2012). 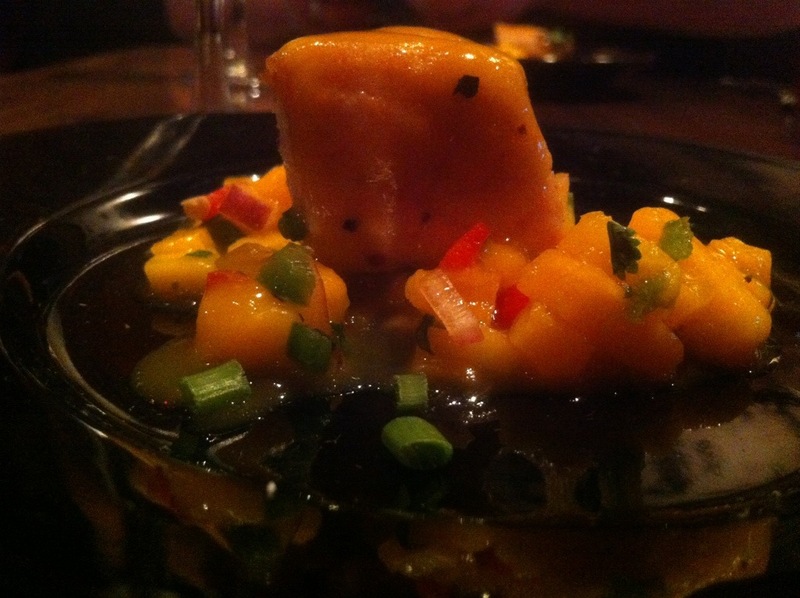 Topped with a mango glaze and served with a mango salsa, the pan-seared swordfish was truly delicious and something I’d order again. I do like the flavor of mango and it compliments the swordfish so well. Our drink pairing was changed up here and we were given Jalapeno Margeritas with the swordfish. When you go to put the glass to your lips you will smell the jalepeno, however I must warn you that while there is a slight kick to the drink it isn’t as strong as you suspect it will be. If you like jalapenos and margeritas this is a fun cocktail for you to try! The first time I met Chef Tony was a at Chowdafest 2014 where we were able to sample his Butternut Squash soup. While I have been talking about the Butternut Squash soup constantly I was very excited to try another soup on Bistro 7’s menu. 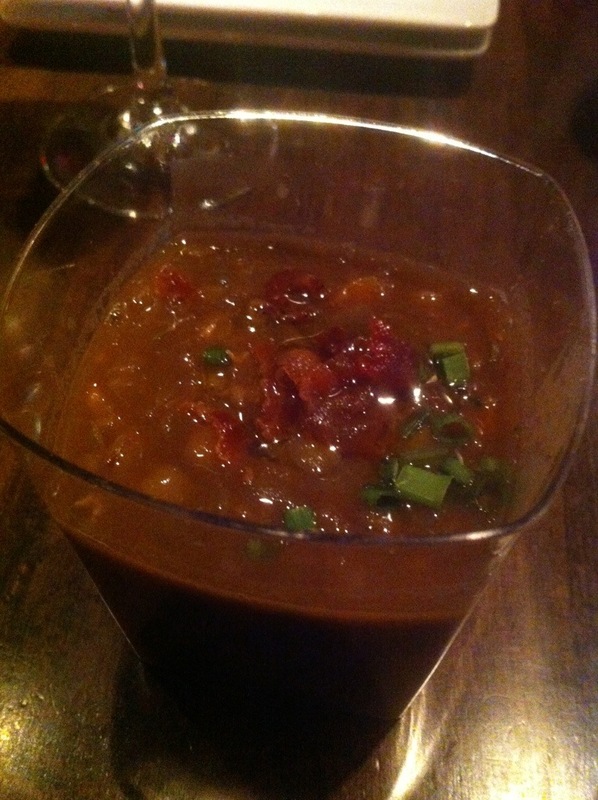 The Lentil Soup is garnished with bacon, and let me tell you, they had me at “garnished with bacon”! Shouldn’t everything be garnished with bacon? The Lentil Soup is hearty, but not too filling, a perfect soup for a cold day. Did I also mention that it is both vegetarian and gluten-free?! 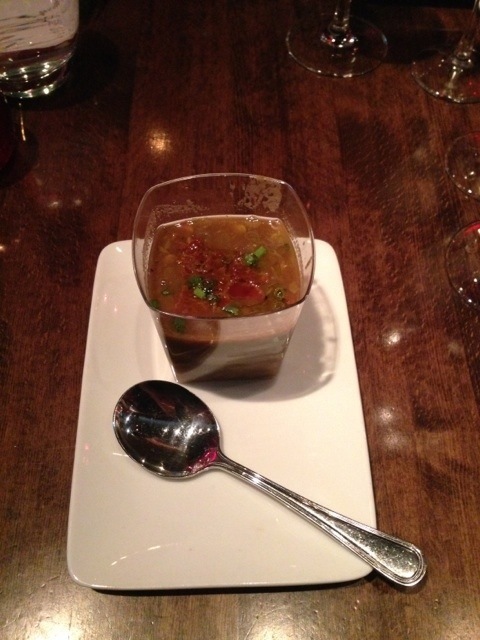 The Lentil Soup was paired with a Rioja Crianza, Ijalba from Spain (2008). These are, by far, some of the most unique sliders I’ve ever eaten. 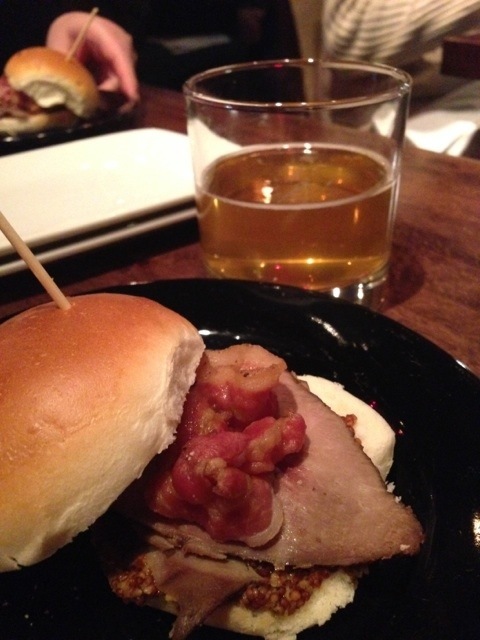 A very fresh slider bun is coated with a grain honey mustard on the bottom and then piled with duck and a slice of proscuitto. Paired with Two Roads Workers Comp Saison Ale, I was pleasantly surprised at how well the duck, proscuitto, and mustard complimented one another. The Workers Comp Saison Ale by Two Roads Brewery also added another level of flavor to this course. 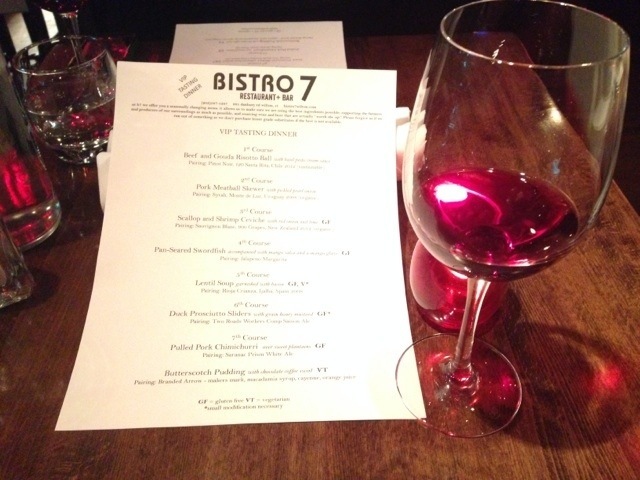 Bistro 7 certainly saved the best for last! Our final course was a perfectly seasoned pulled pork served over perfectly cooked plantains. This dish made me say WOW, and do a little happy dance in my seat. In fact, I was a little sad when I cleaned my plate and it was all gone. The plantains are sweet and their flavor goes so well with the pulled pork. I cannot wait to go back to Bistro 7 and order this dish again! 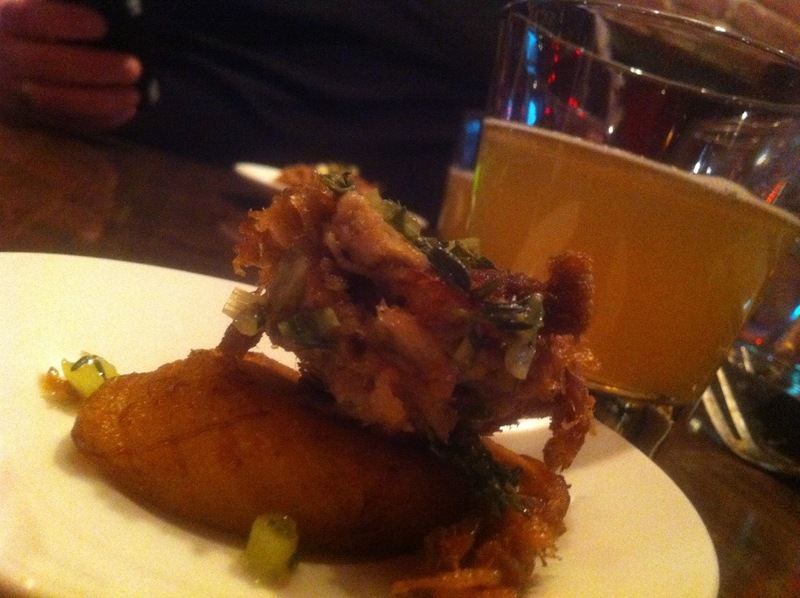 A Saranac Prism White Ale was paired with this dish. Grand finales should be attention grabbing, shouldn’t they? I feel the same way about dessert. You see, to me dessert is the grand finale of a meal. Dessert completes a meal and a wonderful meal should go out with a bang. 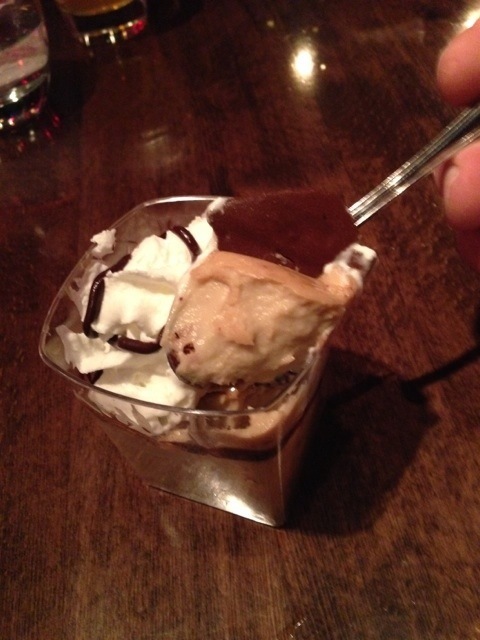 Well, Bistro 7 pulled out their big guns to finish off the show. The Butterscotch Pudding was an attention-grabbing-doing-a-happy-dance-in-my-seat-I-want-to-tell-EVERYONE-about-it kind of dessert. 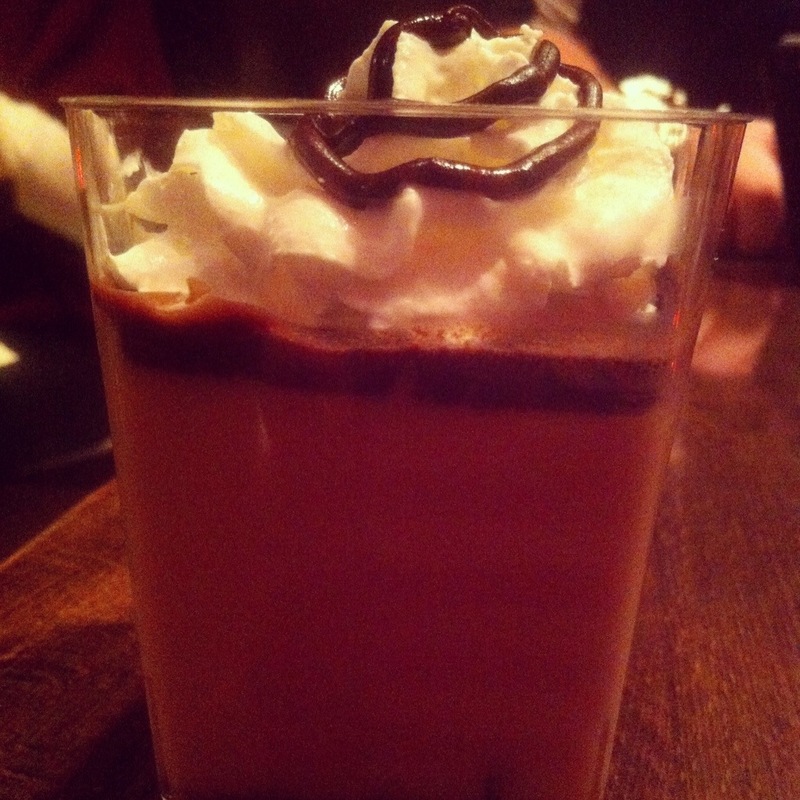 The serving cup was first layered with some crumbled graham cracker, next a homemade butterscotch pudding was added, and on top of that was was a chocolate coffee fudgey layer of amazingness. A little whip cream and chocolate drizzle to top it off, and this was a dessert you can’t stop eating, and when you finish eating it you won’t be able to stop thinking about it.